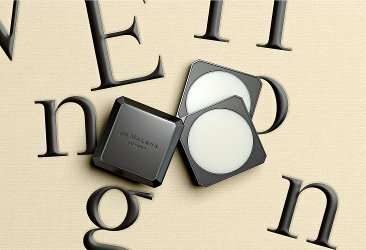 Not my lemming but it might be yours: Jo Malone's new solid perfumes. The (empty) "fragrance combining palette" is $36, and holds two of the 3g fragrances, which are $20 each. Or, buy The Refreshing Pair... "Two much-loved scents in a new solid perfume formula. Spirited Wood Sage & Sea Salt. Mellow English Pear & Freesia. Layered together they create a fresh, fruity fragrance, mellowed with notes of pear, with a touch of sea salt. Presented in our Fragrance Combining™ Palette, which is perfectly-sized to scent your skin on the go...", $76. Hat tip to chocolatemarzipan! Good morning Robin! I tried the spray version of Wood Sage & Sea Salt yesterday, it didn’t work for me at all (unfortunately, but $$ saved). I finished up my linden and went to purchase a replacement and was told it’s discontinued. So more $$ saved. I should work on finishing some of the other Jo Malone’s I already have. I tried the Neroli (and loved it, the hubby did too) but already have Orange Blossom, so no need for another JM for now! I save boatloads of money by just not liking much of anything they make, ha! I am put off by having to buy the container, but as chocolatemarzipan points out below, you can just use your own container, and the price of the pan itself is not bad — $20 for 3 g is cheaper than brands where you can’t refill the container, like Diptyque. I’d still rather pay the $50 for the 4.5g L’Ombre dans L’Eau solid. My solid for L’Ombre dans L’Eau was my first solid from Diptyque, I adore that scent! Me too. I *almost* buy the body butter every week or so. I had a 30 mL of the Orange Blossom that I got as a souvenir from the flagship Nordstrom in Seattle. I thunked the bottle a while ago, as I ended up wearing it quite often. I suppose it’s not earthshaking or terribly original, but I thought it was just really nice and comforting and it became one of my go-to scents for when I didn’t want an assertive or challenging perfume. Wait, hold up – They disco’d the linden?! As in French Lime Blossom? Say it ain’t so. I’ve got to say, I do love the elegance of By Killian and Diptyque’s perfumed solids, they really are luxurious! Yes they do, or did, I don’t know if they’re still available. I have Back to Black in a solid. Heavy weight black container with a lovely feel and design. It just feels substantion and expensive in your hand. I got it as a gift so I have no idea the price and I don’t know if refills are/were around. I have Straight To Heaven in the solid, I think it was my first BK purchase. I just checked the By Killian website and it appears the solids are no longer available. Heh, I am not tempted by these but for someone on a no buy, you are doing a great job of enabling. Naughty! I would prefer solid perfumes to be in a nice refillable lipstick type tube rather than a tin. That way you could apply it directly to your skin without dabbing your fingers in the product …especially if you are dabbing during the day when your fingers might not be clean. Agreed! I like solid perfumes, but would rather not perfume my fingers. Serge Lutens makes a refillable lipstick, but the initial purchase is $75 and refill is $55, that’s pretty pricey! And Jo Loves has the “fragrance paintbrush” gel things. They used to be called Crazylibellule & The Poppies. Oh I see! I didn’t realize that. I’ve got to say I prefer Sabé Masson as a name to Le Soft Perfume or C&TP…. Sabé Masson is probably a better name, especially since they started making liquid perfumes too. Yeah, I don’t like getting perfume under my fingernails. Does anyone know if the Jo Malone solids have better longevity than their sprays? I cant justify dropping a bill for something that lasts 40 mins, tops, no matter how much I love the scent! I would test them out. Some of the Jo Malones last a really good long time and I have scent eating skin.